My very first post of my NOTD. Color Green is my new added favorite color along with pink, red, peach and pink. You might wanna know a little story behind it, I was told by a friend who believes in feung shui, according to my birth month and birth date it is said that one of my lucky colors is green. I really do not understand most of it because I am not quite familiar with feung shui. I just told to self that its not a big deal if I add a little shade of green on my daily dose, right? I am so sorry for the poor quality of picture. But it really looks good in person. 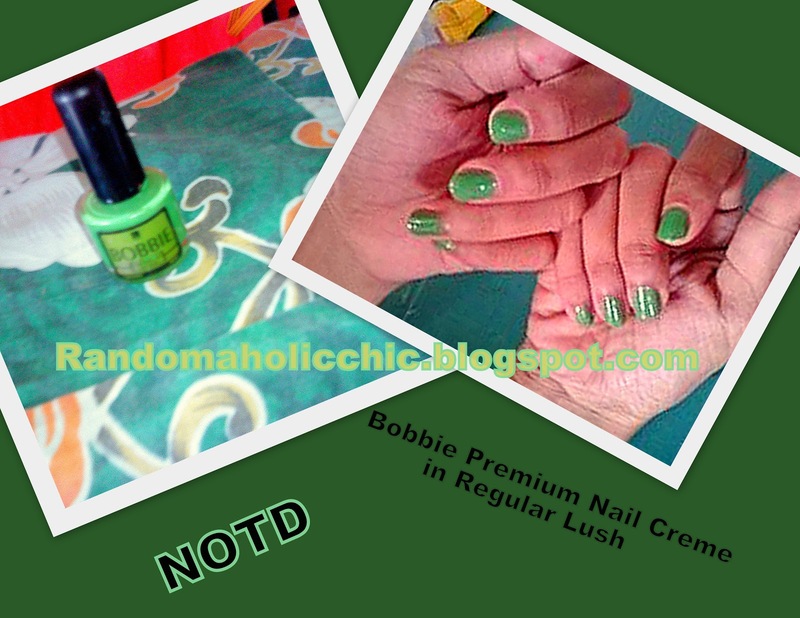 My thoughts on my Bobbie Premium Nail Creme in Regular Lush. Took two coats each to look opaque. It doesn’t take super long to dry. Everyone who notice my nails, love this color. What is your most favorite nail polish color?